Description: "We offer yachtsmen complete maintenance, repair and storage services. We are located in Stonington, Connecticut, a beautifully situated harbor at the eastern most end of Long Island Sound, convenient to Block Island, Fisher's Island, Newport, Martha's Vineyard and the Elizabeth Islands. Our harbor is locally active as well as being a destination for cruising yachtsmen for more than a century. 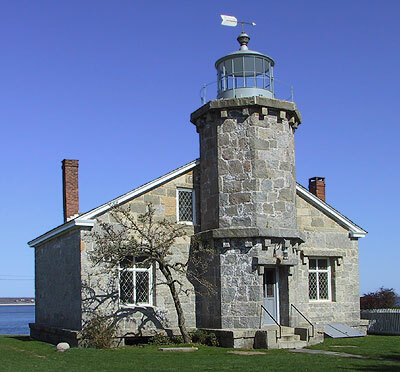 The Borough of Stonington remains one of the best-preserved historic towns in Connecticut -- with the benefits of fine restaurants, shops, inns and convenient travel arrangements." Approaching by water thru Stongington Harbor, and past the commercial fishing fleet, the fairway is to the east and you will see private houses and docks on the starboard side, a large mooring field on your port side, and dead ahead, the Dog Watch Cafe. Dodson's Boatyard is to the left of the Dog Watch. Call the dock master on VHF Ch 78. Angus McPhee at mooring 33G during a recent visit. The mooring field is serviced by two excellent launches. The launches operate the full length of the harbor. Contact the launch on VHF Ch 78. The north dock of the commercial fleet is visible from the mooring field. If you walk down High or Pearl streets from Water Street, you will find the smaller commercial vessels. Also on Pearl Street you will find a seasonal farmers market and a very nice fresh fish market. Walking down Broad Street we caught this view of our boat Nancy Ann in the mooring field [33E]. Water Street is where most of the interesting shops and restaurants are. The Breakwater Restaurant is one of our favorites. View from the deck at the Breakwater Restaurant.